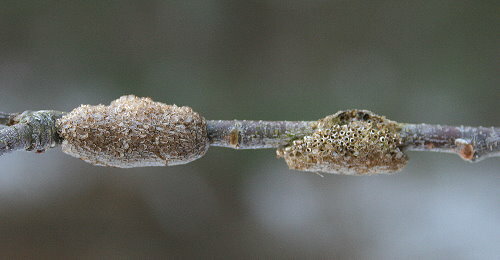 Last spring I found a weird clump of insect eggs wrapped around a twig on a small tree at the research station. I discovered what it was while looking for something else on BugGuide.net. It turned out it was a bunch of tent caterpillar eggs. So knowing what they look like, this winter I’ve kept my eyes open to see if I could spot any prior to them setting up shop in their little tents. 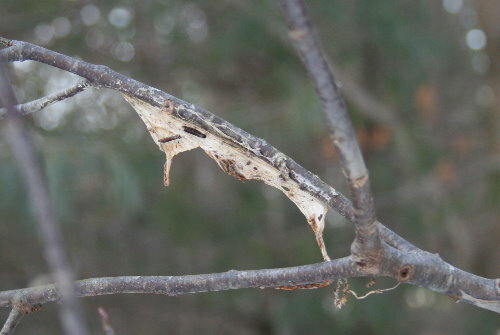 Eastern Tent Caterpillars prefer trees in the family Rosaceae. This includes the cherries (Black Cherry, Chokecherry), as well as hawthorn, crabapple and apple trees. Those are the species I most often see their nests on. 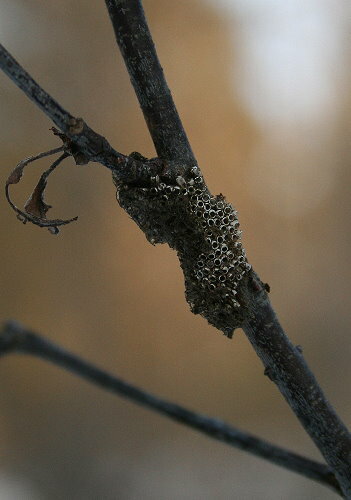 The closely related Forest Tent Caterpillar opts for oaks and maples. 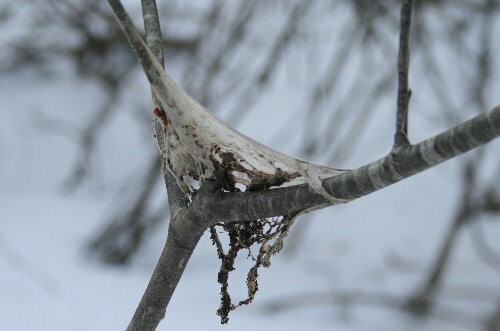 For both species, theirs are the web nests you see in the spring; webs later in the summer and fall belong to another species, usually the Fall Webworm. I had checked out the apple trees on the property down the road I often vist, but hadn’t noticed any egg clusters. Yesterday I took Raven back there for the first time in ages, since the snow started to melt (before it was quite a trudge in there, with snow up to your shins). Walking down the path I passed by a small sapling with the remains of a nest in it. I’m not sure how I’d managed to miss it on all my previous visits; looking elsewhere, I guess. In any case, I paused here to check for eggs. I didn’t find any new egg clusters, but I did find what was left of last year’s. I could tell they were old because the eggs were all open, their tops popped off when the little baby caterpillars left last spring. Or possibly even the spring before, I don’t know how long these egg masses last. There were four such clusters on this small little tree – it was evidently hard-hit last year, but spared this year. A bit further up the path was an older tree, much larger, with a branch that hung down low to eye level beside the path. On said branch was another old nest. Interestingly, this one had some shed caterpillar skins still clinging to it. As the caterpillars grow, they shed their old skins and leave them behind, often trapped in the layers of their web. At the end of the summer you can sometimes find nests with the old skins inside, but I was a bit surprised to still find them there this late in the winter. It was here on this tree that I found some new egg clusters. They’re very distinctive, with a hard, shiny shellac to them that smooths over the egg surfaces and protects them from the elements. I’m not sure what the shellac is made of, but I presume the little caterpillars have to chew their way out after leaving the eggs. 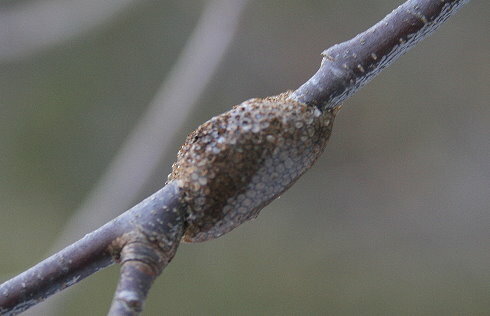 The whole cluster is no more than an inch long (2.5 cm), but wraps nearly completely around the branch. It’s possible for there to be up to 200-300 eggs crammed into that small mass. This tree had a few egg clusters from last year (obviously, as they would’ve hatched out the inhabitants of the old nest in the tree), as well as the ones from this year. It looked, at least from the ones I found, that there were more eggs this year than last on this tree. On one branch, I found a new egg mass less than an inch from last year’s old one, an interesting juxtaposition of the past and the future. It’s funny how the tents can take you completely by surprise come spring, like they came out of nowhere. And yet, they were there all along, hidden on the branches in plain sight. I’ll have to remember to watch for these guys when they hatch out and start building their webs in late April. Those eggs certainly don’t look like average eggs. Just blobs on the twigs. Tent caterpillars are interesting creatures, living inside their protective webs. I’ve seen them on various bushes, and huge masses infest walnut trees in my state. Nice photos. Hey Seab! How’s life up in the Frontenac? Actually I came across the NBN through your blog, which I subscribed to a few months ago (seems like you’ve got quite a following here!) The moth guide project sounds very cool, I’ll have to pick up a copy when it comes out — we get hordes of neat-looking species coming to the boathouse light while up at the cottage during the summer, but my little beginner Peterson guide just doesn’t cut it. I’m glad you described the “hard, shiny shellac” on the egg cases. The one in the fourth photo, because of the distribution of its colouring, made me think the eggs were transparent (like frogs’ eggs for example) . The one in the fifth photo, on the other hand, is obviously opaque.